I have been wanting to do a h23 DOHC head swap on to my SOHC block for a while and with the prelude not running right this was the perfect time. I picked up an h23 with 170,000 miles for $75 through a buddy of mine. The motor has a knock and is missing the throttle body, but is in great shape other wise. I only need the head anyway so I'm not worried about the rod knock. I found out that the f22 and h23's throttle bodies are not interchangable unlike most other parts. So the goals for tomorrow are to pick up the new head gasket, find a throttle body, and get the h23 head on. So far things have been going fairly smooth. Hopefully tomorrow will be more of the same. Nice project! what will the h23 head do to your compression? obviously the head will flow better than a SOHC head. goodluck! working on an F22b1 right now thoguht about putting an H23 head on it....we should talk Mike. i'm rebuilding an entire H23 for a firend of mine, adn we putting new head so i get his old one.....pm or post, let me know, adn of course keep us posted. on and no the F intakle doesnt line up...but the A6 does, adn its a dual runner manifold....u should look into it. thats what i wanna do. check the gaskets. yeah its definitely a fun project. right now both motors are in about a million pieces. it's kinda scary actually, i hope i can get everything back together in working order. today i was able to get the f22 head off and that's about it. I picked up an f23 head gasket, but i still need an h23 throttle body, h23 timing belt and apparently and h23 distributor. I also need a 450cc injector b/c i dropped one and broke the little cap off the end. DOOOH!! I'll have more pics of the disassembled f22 head and block tomorrow. I'm sure you'll get it together. I'd say take your time since you have a daily driver. if it makes u feel any better u can pull the caps off of any of your stock injectors to put o there, but actally, they dont teven have to be on there. i ran mine without the caps for a few weeks before getting set of them off old ones to put on my new ones. that is if you're talking about the plastic things that are on the actual injector end? they just for support in the head. like guides. and u said F23 head gasket? guess i need to chk those threads u listed before i get to thinkin i know what i'm doin!lol. Man, your making me jealous. I wish that i had guts enough to do something like this. Your giving me a kind of a fever....I'm going to have to get something new! it's a lot easier to do when you know you have a daily driver as a backup. plus i only paid $75 for the h23 so it wont be a huge loss if something goes wrong. the object is to have fun! looks like you're doing just that, and its really not that hard of a thing, as i have come to figure. specially after the first one. lookin good Mike. u still going with boost right? sound foolish toask, but just making sure. as for the injectors, that plastic cap is like the ones on mine, and they are guides for the injector tip. they have the holes to allow flow. u can interchange them though. they are tough to get off, and you dont want to break them as i'm sure you are now aware, but it's prolly a lot cheaper than a new injector. what brand of injectoer is it? maybe i can get you hooked up lone wayt or the other. Yeah I am definitely having fun and yes it will be boosted. I got the injectors from Tuner Toys. It was there Honda Performance Injector rated at 450cc. Didn't really do a whole lot since it was really cold today. I got all the coolant and vaccum hoses transfered over as well as the bracket for the powersteering. The head is pretty much ready to be put on so hopefully that will happen tomorrow. this thread is getting me so pumped to do my auto manual conversion, but i'm waiting till spring for that. considering that there is a nice half inch of ice on my car i thought waiting for warm weather would be a good idea. hehe. in the mean time i've got a lot of time to find all the parts and at good prices. If I didn't have a garage I wouldn't do this during the winter. The winter is a good time to do research and gather parts like you said. The last I checked, the H22 and H23 TB's were interchangible. I know you can bolt the H23 upper plenum/TB onto the F22a6 manifold. So in theory the F22 plenum should bolt on the H23 IM. However, since you have the F22a1, you wouldn't have the dual runner setup anyways, so I don't know if that directly affects the plenum. Plus, the F22 TB is smaller than the H series ones anyways. From what I remember, while both H tb's work, the H22 one is bigger, so it might be worth looking into. the f will intake will not bolt to the h head no matter how you look at it. the water coolant ports are WAY off. aside from the dual runners even. but, if oyu could get an A6 it owuld bolt up to the H head and you would then have dual runner intake for mor plenum space and intake availablity. still figuring out what he wants ot do about the parts Mike, but if all falls thorough, i can get oyu a reman distributor for about 100.00. keep in touch. 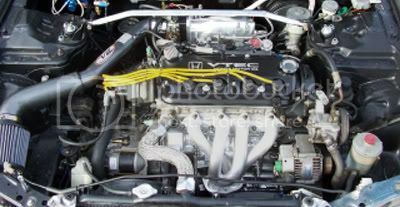 Both the H23 and H22 are dual runner intake manifolds. The H23 Intake bolts to the F22 block. The H-series upper plenum bolts to the F22a6 Intake manifold. Some modification is needed as far as the coolant lines are concerned, but it will work. It's really a moot point though, because if you were to use an F series IM on an H, assuming you could get it to work, it wouldn't be a benefit in power, rather, a loss. i've missed you Warrior!! i knew this too was something u and i had discuuse! !thank you "noob".lol. we're working oln that part btw. i'm currious, would a dh-racing 73mm tb and a ported a6 manifold be any good? sorry for the lack of updates but i was out of town seeing Incubus in concert (great show btw). well i got the head on and started reconnecting things. i also started working on the timing back together, since my new timing and waterpump belt finally showed up. doesn't matter though b/c the timing belt i got doesnt fit anyway. i tried using the h23 belt like most people do, but it was too big and i couldn't get it tensioned enough. 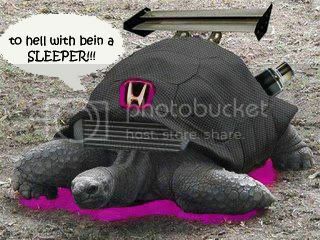 luckily someone found out that a gsr timing belt will work, so i'll have to order one of them. my new injector should be here tomorrow, but i am still looking for a tb and dizzy. pics to come in the next few days.